Hello and happy weekend! 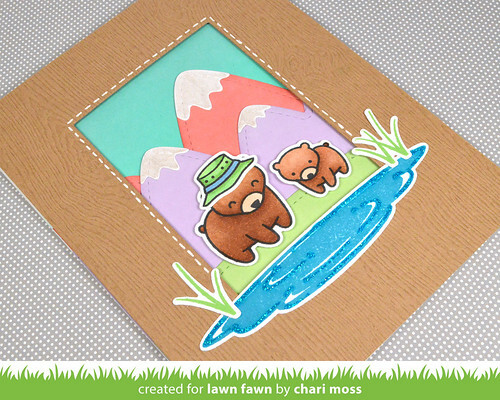 Today I am sharing a card with the new set Dad + Me and new Stitched Mountain Border die for Lawn Fawn May Inspiration Week. Much like the Mom + Me set this one is just too adorable. I love the little glasses and accessories for the moose and bears. Although I do love the costume elements I kept this card a little simpler by just adding a hat to my daddy bear. 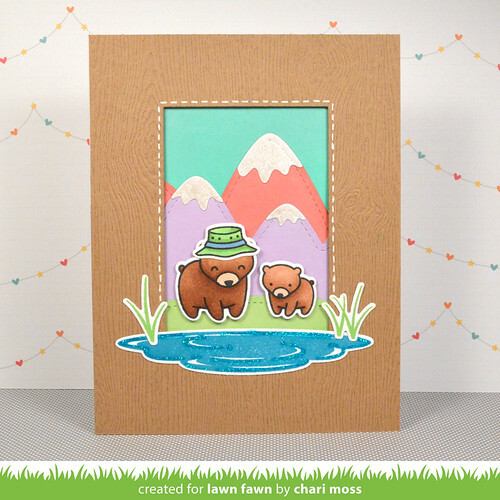 I layered the mountains and a simple stitched hillside to create the landscape for my papa and baby bear. I love the pond, I stamped it in fishtank ink and added it over top of the frame to create the look of the scene coming out of the frame. The sky, mountains and grass are all colored by blending ink on white cardstock. I used mermaid and merman for the sky, wild rose and fresh lavender for the mountains and celery stick for the ground. I love that the inks blend so smooth you can basically create your own colored cardstock! I added some sea glass stickles to the pond and some pearl watercolor to the snow caps of the mountains. Be sure to check out the Lawn Fawn Blog today for more projects with Dad + Me and Stitched Mountain Borders. Oh Chari, this is SUPER cute! I love EVERY THING about this card. A fantastic job! Cute scene, and I just love the little pond in front!